Zaanse Schans is a beautiful town that was pieced together to form what is known as an outdoor museum. Altogether, there are 35 houses, windmills, barns and museums that date back to the 18th and 19th century style. This is an amazing place to visit and boasts exceptional landscapes with beautiful weather. 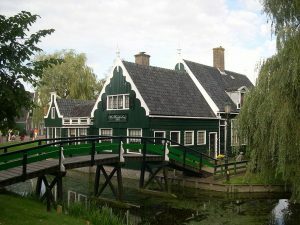 In the town, there are 4 museums that operate and display the true history of the Netherlands. Dating back to 1658, this museum is filled with amazing aromas and even more delicious food. A marble floor is laid down and provides a beautiful look back into the past of baking. Inside, you can view old cookware that was used throughout the centuries and taste many of the local treats. The museum is open every day from 10 am – 5pm. Admission is free, while foods in the bakery are not. The Zaans Museum and the Verkade Pavilion is a treat for kids and adults alike. Step back in time to view clothing, paintings and equipment from the past. All of these items were once part of the food industry and guests can enjoy biscuits and treats during their visit. Adults are required to pay 10 euros, children up to the age of 12 pay 5 euros and those between the ages of 12 – 17 pay 7 euros to enter. The Albert Heijn Museum Shop brings to life a typical 19th century grocery store that was home to the famous Albert Heijn. The shop is constructed from two different buildings and is a perfect example of how timed grocery stores once looked.